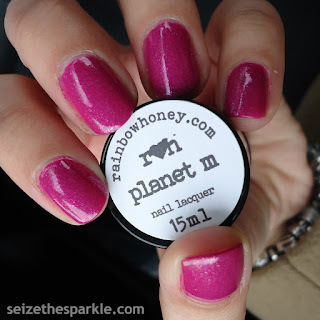 Planet M is one of two polishes in my Mystery Bag this month. It's a blue-toned raspberry pink shade that I just love! And yes, while I do have a lot of this shade in my stash, the finish is what makes Planet M unique. Tons of tiny little glass flecks, mainly in pink, but I caught some violet and gold flashes in there too. It's a little more amped up than your average shimmer polish. The formula on Planet M was really good. Just a smidge thicker than the creme polish formula, but that's because of the glass flecks and doesn't affect application at all! I did find that I had slight patchiness at two coats, so I added a third just to make sure everything was covered. In addition to Planet M, my Mystery Bag also came with Caramel Forest, a really unique glitter topper. It doesn't really go with Planet M all that well, so I'm still trying to figure out what I could layer it wish and how to do it! I can't say that I have too much in the way of plans for this weekend. Maybe a little shopping. Definitely a lot of playing and snuggling with Peanut. Whatever your weekend plans look like... I hope you and your family have a great one!! !